The day I learned of Michael Harner’s transition I laid my head on my desk and sobbed. First there is always the shock of such news and then comes the process of letting go of our loved ones. Fortunately, this has been easier with my spiritual father because he couldn’t be in better hands than with his intimate spirit family. Through direct instruction from Michael over the decades at various workshops, and at the two-week FSS course in CA (where at dinner I happily tolerated his good-humored teasing about how a musician actually makes a living), I know these things to be certain: Michael’s vision, humility, compassion for humanity and dedication to his sacred mission of introducing core shamanic practices to the West, are forever imprinted upon my heart and live on through his students. Blessings and Light upon Sandra and the entire FSS staff, who are carrying the torch of teaching direct access to Spirit. May the FSS flourish and receive the support and acknowledgement it needs to continue awakening humanity. With love and gratitude, “The Riverboat Musician” // p.s. Michael, thanks for saying hi to Milo. As I hearken back to the beginnings of my own training about 25 years ago, one teacher/mentor stands out: Michael Harner. I was introduced to this system in a two day course that he taught and after leaving that course, I knew this was the next step in my path. I was on fire and grabbed any and all training I could in Core Shamanism and other approaches. I then took a two week intensive at Esalen in California he and Sandra Ingerman taught, then a three year program that, if I had any doubts, confirmed this was my path. Michael had been criticized by the scientific community for teaching these courses and I recall him saying in response to these criticisms, “As long as humans are doing what they do to the earth, I will continue teaching these methods.” It was that kind of courage that I admired, along with his clarity and humility. He knew who he was and he knew what his mission was. It is with some sadness that I heard the news over the weekend that he had died, while at the same time appreciating the immense legacy this great man brought to the world. I will forever remember him with joy in my heart and appreciation that I had the opportunity receive some training and mentoring. All my life from 18 years old I’ve been drumming in a professional way, from the 30 years old searching for the spiritual dimension in me,twelve years ago I make ‘The Way of the Shaman’ in Spain, now, I’m guest faculty in Spain. Is practicing core-shamanic healing and now sharing this knowledge that I begin to understand. Day after day I can give witness that the wisdom of Michael Harner has been great. And for me has been a way to unsdestand the ‘way of the center’, the way of to take the leadering of my own spirituality, and how to take this spiritual methodology to give service and healing. My most sincere thanks, Michael Harner, to what you have created. I have not kown you in person, only from your work, I live a little bit far away. Thanks to what from you has arrived to me. So much is what you have come to transmit me. Thanks to how much generosity and love have you had available to leave this beautiful legacy. With absolute honor, absolute gratitude, and with absolute respect, I take such this immense gift and with absolute enthusiasm, ethics, loyalty and fidelity, I will continue to be delighted to spread this immense knowledge. Thanks also to Alicia Luengas, Susan and all the staff that make with his work this transmission possible. My gratitude to Michael Harner for this work and bringing this into my life. Approaching 20 years since I first took the Basic workshop and my spiritual life has never been the same. I offer a special thanks for the work of the foundation that has brought me full circle and opened a new relationship with my ancestors from Mexico. I would have left my interest in curanderismo on the back burner if not for this work and especially the deep and magnificent training of the Three Year Program. I will remember fondly his wise words- “journey on it”. It was with profound sadness to hear the passing of Michael. I had the very great honor to be coached by Michael and Sandra on my initial introduction to shamanism a number of years ago. I did not fully realize what I was signing up for when I registered for the class. A good friend pushed me to sign up. I had read some of the suggested books prior to going so I had a small idea of what to expect. The amount of one on one time and clarity of vision that Michael exposed me to has been life and focus altering for me. I have not been able to follow up on more extensive training sadly due to distance and financial issues, but the basics that I learned on that weekend are beyond measure and I try to practice what I learned on those two days. I keep trying to expand by reading and following the recordings that I have collected and being overjoyed by how my spiritual life has/is expanded and been comforted. I have photos of Michael and Sandra at my class that I look at frequently. It is a joy to see and remember them in those times. We have lost a guiding giant. Thanks alone cannot express the profound changes that this man and his ideas have brought. Let us each keep our journey going. I am full of gratitude, honor and respect for Michael Harner and his teachings, his vision and his legacy. Taking his workshops made my heart sing. Great blessings to Sandra, the entire family and staff of the Foundation and to Susan, who continues holding the torch. Michael, you must feel deep comfort knowing that the work of your life is left in such capable hearts and hands. Your humor and wisdom will forever live on through so many of us. You are true inspiration. Bless you as you continue to explore the realms from another perspective. Forever in my heart. Over the course of the past few months I’ve been dealing with a a medical situation affecting my wife. There was a very long hospital stay. In the course of this stay I chanced to come across a copy of Way of the Shaman. I provided a tremendous spiritual resource for this challenge and helped me begin a new path in development. In view of the sad news I will say thanks, Michael, for showing the way and providing inspiration in following it. It is true you have transitioned to another level, but you are not totally separated from me and those of us here when we need you. During the FSS 3-Year Program, I was walking with another student on the road to the classroom, when Michael drives up behind us, leans out the window, and asks, “Is this the road to enlightenment?” Yup. In the early 80’s I took my first workshop with Michael. It put me on the path that sustains me everyday and made my life possible. The study and daily practice of shamanism has lead me to so many wondrous people, places and experiences on so many levels. Thank you Michael for the gifts of your teachings and for sharing your time here with so many of us. Blessings to all in the Foundation Family. His books have always been with me. I learned from him everything I know about shamanism today. Goodbye Michael Harner – my Master. Over the years that I have been a member of the FSS I have worked with many people, and groups of people. They range from students in K-12, local Universities, at risk youth, adult people and students with disabilities, and now with soldiers suffering with PTSD and addiction. 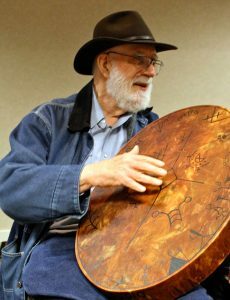 Drumming has always been a part of the programs as well as journey work and methodologies Michael Harner has developed in his work in the field of Shamanism. My path to these programs has been a result of the passion Michael Harner had for Humanity. It would be impossible to count the people that have benefitted from his groundbreaking work. But I do recall many comments, faces and instances, from those that found healing in their lives through his work. As a combat veteran of the Vietnam war, and now 70 years of age, I find the work more important than ever. My volunteer work with veterans suffering from PTSD and the scars war leave behind is based on Michaels work. I am blessed to have the opportunity to work with these people, but, equally blessed to have a base to help relieve the suffering I see in the eyes of these courageous soldiers. I am sure Michaels work will continue to heal the suffering so many are in need of, both here and through the many people that have taken his workshops. Yes, We are blessed. Thank you for your comment. It is great. Michael remains Great. Michael’s spirit offered depth and joy as he enabled each among us turning to open to spirit within. “Ask spirit” is now a fundamental healing pathway. Love and joy to all of us blessed to know him. Thanks Michael. Last November un Argentina learnt your techniques from Gerardo. Such a sad new. My respects to the family. Thanks again. I was hoping Time would give me eloquent words, but it has not. I feel the Void of his body as it no longer occupies space on the surface of the Earth, and yet I feel blessed having had the privilege and opportunity to have met Michael personally, not just through his books. What sticks in my mind most and holds fond memories, was a Skype call/visit from Michael with our class. We were invited to ask Michael questions. When I introduced myself on the call, I reminded him I had previously taken a class with him. A wry smile came across his face and then I knew: He had captured the essence of me. Thank you Michael for your quick wit and humor! Thank you for opening the door and providing a foundation for so many rich conversations and experiences from the basic, the weekend workshops, the two week intensive, the three year program and circle reunions. Thank you for the teachers and practitioners who sprung from the work, to write books, to learn from their helpers and to heal others, seen and unseen. Thank you for the foresight to create a repository of modern shamanic experiences. Michael was my dissertation supervisor in the PhD program at the New School. He was a kind and supportive man who helped me a number of times, and was a fine teacher. When I sought grants for my research, he helped. When I was writing my dissertation, he supported me. For my defense, he prepared me well. In the defense itself, he was my champion. I owe a long and successful career largely to him. Thank you, Michael.Know that you have done well, and done good. I love you, Michael. I love you, Sandra. Some of the happiest days of my life were spent with you at Esalen years ago. Thank you for all you have given us. We will never forget. Thank you, Michael. I was so fortunate to train with you. I cannot imagine what my life would be like now without that experience. I miss you. We all miss you. May his long journey into rest be as peaceful as the peace inherent in his lessons he gave, and the legacy his life provides.